I was looking for a way besides a salad to use up the remainder of the copious romaine lettuce from our CSA. Since we hadn’t had falafel in a while, I settled on a nice and easy falafel wrap. This meal was quick, tasty, and absolutely delicious. 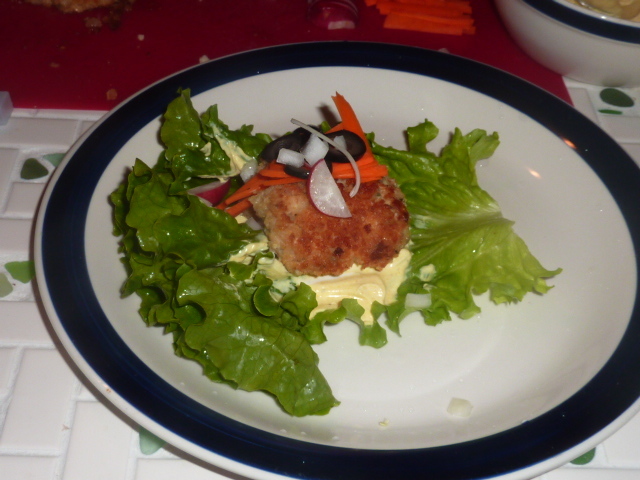 I really liked the romaine lettuce as opposed to the more traditional iceberg lettuce usually used in lettuce wraps. It had a bigger punch of flavor, but the crispy ribs still gave a really satisfying crunch. In a food processor, add chickpeas. While slowly adding roughly 1/4 cup of reserved chickpea liquid, process the chickpea mixture until smooth. It may be necessary to scrape down the sides of your food processor a few times or add additional reserved liquid or water to achieve a nearly smooth texture. The final result should not be watery. It should be firm to the touch and easy to roll into ball form. Transfer to a large bowl. Add red onion, red pepper flakes, garlic, parsley, 1/2 cup bread crumbs and kosher salt and freshly cracked black pepper. Mix well. Roll into 8-10 tubes of 1″ diameter. Place remaining 1/2 cup of bread crumbs on a large dish. In another large bowl, add beaten egg. Coat each patty in egg and then bread crumbs. Heat canola oil in a large skillet over medium heat. Add tubes, working in batches if necessary, and cook until golden brown on each side (roughly 3-4 minutes per side). Add more canola oil as necessary. Drain on paper towels and serve immediately alongside following ingredients. Serve all ingredients separately and allow your guests to assemble to taste. This dish was a combined effort for Zak and I. He made the fattoush salad, I made the falafel and the yogurt dressing and assembled the sandwiches. This meal was fresh and delicious and makes for great leftovers. Each component of this mouthwatering, refreshing sandwich would be fantastic on it’s own. If you are looking for a healthy crowd pleaser, this recipe is the way to go. Toss all ingredients well to combine. Whisk all ingredients together and add to salad. Note that this recipe produces a lot of fattoush, so plan for leftovers. In a food processor, combine chickpeas and lemon juice. While slowly adding roughly 1/4 cup of reserved chickpea liquid, process the chickpea mixture until smooth. It may be necessary to scrape down the sides of your food processor a few times or add additional reserved liquid or water to achieve a nearly smooth texture. The final result should not be watery. It should be firm to the touch and easy to roll into ball form. Transfer to a large bowl. Add red onion, red pepper flakes, garlic, parsley, 1/2 cup bread crumbs and kosher salt and freshly cracked black pepper. Mix well. Roll into 12 or so balls and then flatten to form patties. Place remaining 1 cup of bread crumbs on a large dish. In another large bowl, add beaten eggs. Coat each patty in egg and then bread crumbs. Heat canola oil in a large skillet over medium heat. Add patties, working in batches if necessary, and cook until golden brown on each side (roughly 3-4 minutes per side). Add more canola oil as necessary. Drain on paper towels. Cut mini-pocket pitas in half. Place about a tablespoon of yogurt dressing in each pita pocket half and use a butter knife to spread evenly on both halves of pita pocket. Add a heaping tablespoon of fattoush salad. 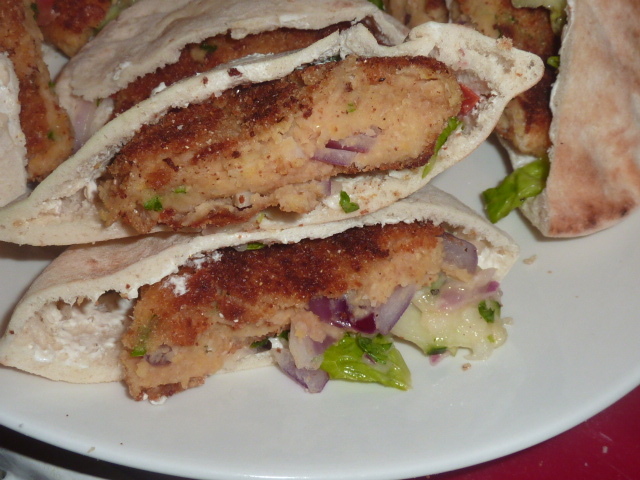 Cut one falafel patty in half and add 1 or 2 patty halves to each pita pocket.